In each of the seven draft rounds, the teams that were the least successful during the previous season pick first, while teams that were most successful pick last. The NFL structured the draft in this manner to encourage league parity. But it’s not just the fans that are mistaken. 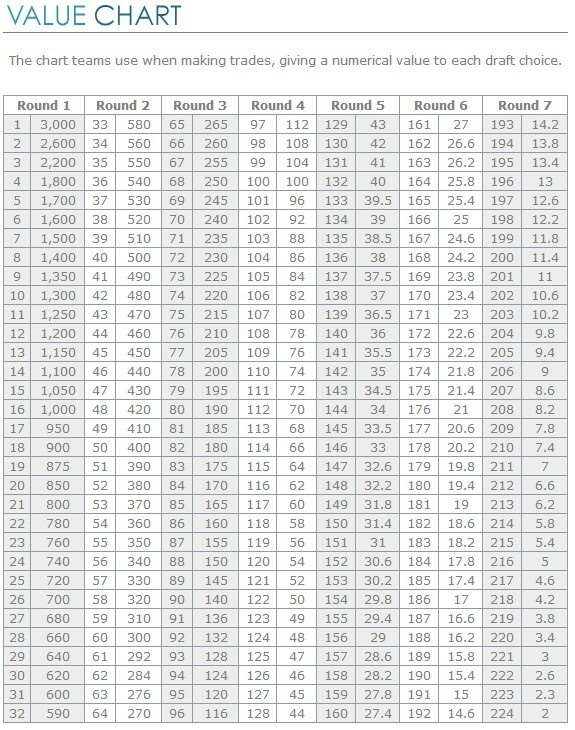 Some NFL general managers still use The Chart (see below) to determine the values of their draft picks. The Chart is a document developed prior to the salary-cap era and it defines the value of each slot in the draft using previous trades as benchmarks. For example, the Chart suggests that the first pick is worth three times the value of the 16th pick. How can leaders make the most of their opportunities? With all of their experience evaluating talent, why do NFL executives continue to make the same mistakes, year after year? Massey says that, as a rule, “we’re overconfident in what we think is going to happen.” NFL talent evaluators are overconfident in their ability to distinguish the good players from the great players. Yes, draft order is related to performance, and it does take skill to rank players. But, as Massey states, “when it comes down to picking between the next two running backs, or defensive ends, the odds of picking the best one is 52 percent.” In other words, they might as well flip a coin. Additionally, Massey says that one of the most powerful tools that leaders, in the NFL and otherwise, have at their disposal is their ability to invite dissent. “You’ve got to be able to tolerate conflicting opinions.” Because many leaders receive less dissent the higher they climb in an organization, it may be necessary to be creative. Aside from simply asking for differing opinions, a leader may need to leave the room, have one-on-one conversations, or assign someone to play contrarian.